Investment in our Capital City is critical. to our long term success. As Mayor, I have made economic growth and opportunity a top priority. When I took office there was minimal development activity in our downtown and even less in our neighborhoods. Today, we have approximately 70 projects either completed, under construction, or in the pipeline. With more investment and development than we’ve seen in over a decade, Providence is a city on the rise! As a growing and vibrant city, we see increasing interest from people who want to invest in our future. We consider every proposal on its merits and always keep the best long-term interests of the city in mind. With respect to the Hope Point Tower, I have listened to residents and to a myriad of stakeholders’ views. I deeply appreciate everyone’s input and the fact that people care so much about our city. With all of this in mind, I made it clear to the developer and to the public that the design of the building was my top priority. I want to be sure that the building, both from a skyline and from a streetscape perspective, worked for the city. I requested that the City, either through the DDRC or the Planning Department, have final approval over the design of the project, rather than merely advisory input. If this building is going to reshape our skyline, then the city should be able to approve what it looks like. Residents of Providence have also asked that a “public benefit” be an component of this project. The proposed zoning change is an extraordinary step and it significantly increases the value of the parcel. Given that the project is adjacent to the 1-195 park land and the new pedestrian bridge, the City has asked for maintenance support of the bridge. All 1-195 land developments provide funding to support the I-195 park land and the City is seeking complimentary funds for the bridge – a major piece of infrastructure connecting the Innovation and Design District. In fact, public benefit requirements are common feature of such development projects in cities throughout the nation. Last, we want to encouraged development and disincentivize landbanking. As such, we asked that the developer start and complete this project within a reasonable timetable. While the developer was amenable to giving some assurances on the timeline and open to some level of public benefit contribution, we were not able to reach agreement on the first and most important point. Given that this project would reshape our skyline and dramatically impact our streetscape, I made it clear both privately and publicly, that the design of the building was my top priority. The developer has been unwilling to provide assurances that the city’s design recommendations would not be disregarded. As such, I have decided to veto this zoning change. The veto appears to lessen the chances that the Hope Point Tower will move forward, but it doesn’t guarantee that the project is dead, for two reasons. First, the City Council could still override Elorza’s veto with 10 votes, although that would require at least one councilor who already voted against the zoning change to switch sides and support the proposal. Second, Senate President Dominick Ruggerio, a vocal supporter of the project, has already said he intends to introduce legislation that would strip Providence of its zoning authority on the former 195 land, which render Elorza’s veto moot. I find this action by the Mayor disgraceful, disappointing, and deeply embarrassing. But, on the other hand, it should not surprise anyone given his political leaning. I hope and will use my voice to encourage a City Council override AND state action in stripping the city of any zoning authority in the district. This Mayor has exposed himself sufficiently to have lost all pretense as a big city leader. Its extremely discouraging to say the least. Hopefully the new vote passes. Very disappointed. Scares people away who wants to invest in the city and it’s very little that someone wants to spend 300 million. Agree with Steve. Time for the State to take charge of planning and development for these parcels. The Mayor does not understand the gravity of his actions in only listening to the BANANAS. Connecticut just elected a new governor that is focused on economic growth in a similar way as Chuckie Baker (MA). Rhode Island is in trouble and more so now with this unwise decision. Mr. Speaker, please lead! Not happy with what our zoning law does and does not allow? For better or worse, that code is the product of a democratic process, our best attempt to guide change in a manner most satisfactory to the greatest number of the people who already live and have investments here. Just because a guy comes along and *says* he has $300M, he should rule over that? I can show him parking craters, eyesores and vacant property in every neighborhood where he can take his $300M and be a responsible developer and landlord, by the book. A better city would result. That stupid building. None of us would be admiring its bold futurismo design from a seat in a helicopter, like the misleading pictures show. Our experience of it would be trudging or inching in traffic past yet another giant boring blank grimy garage. This is the sort of project that if it doesn’t happen, then a few years down the line the naysayers will begin to regret their decision to oppose after realizing what an advantageous opportunity this was. I agree with Andrew, the building will be ugly at street level and at a distance too. And its financially questionable, see golocal for a post with the actual numbers, it may well leave us with a partially filled hole in the ground. There are legit process issues – should we cater to an out of state developer who wants to totally overturn local zoning, ignore community input, and refuses to compromise with the elected Mayor? Should legislative leaders be empowered to overturn zoning in communities they do not even live in? Finally, if there re is a market for so many luxury apartments, Fane or other developers will surely find a way to meet that demand. Whether people like the zoning or not or agree with the Mayor’s veto or not, if this project gets killed, it will send a resounding message to the entire planet that Providence and the state of Rhode Island is nowhere to even consider investing in real estate, jobs, business, or anything else. Commenting is helpful, but it’s more important for politicians to hear views. Whatever your view might be, send emails or even old fashioned letters to Ruggerio, Mattiello, and Raimondo. If you live in Providence do the same with City Council members. Focus on parking craters and height are hot button issues that lead to polarization and shut down of discussion. Yes, zoning is law, but its a highly dubious politicized mechanism only a hundred years old pretending to be a science, which among other things, produces or reinforces segregation by class and race, sprawl, high housing costs, parking craters and car culture. If a design is outstanding and responsive to its surroundings, no matter what the height, it would be more difficult to dismiss out right. The current design is an improvement over earlier versions, but certainly can be improved much further. Aside from the height, a more constructive dialogue might be to discuss how the proportion of the tower might be improved, or how to modify the base with an active use wrapper or eliminate the base entirely, or how the ground level on both the street and the park sides could be activated, or how might the facade materialization be made to better complement the surrounding buildings on both sides of the river. Exactly as Peter said —- Send emails and letters to all members of the City Council strongly urging a veto override and to Ruggiero, Mattiello, and the Governor urging a state takeover of th district development!! Otherwise, the BANANAS will prevail. If the design is really the reason that people are against it, then they don’t understand the developmental process. The design stage changes constantly and certainly would improve. The design is important, but its what the building PROVIDES that counts for this city and those who work live and visit here. There are a number of cases in this city where people hated the design of a proposed development, but down the road, the building provided jobs, and an incentive to be in Providence no matter its purpose and over time it was accepted. DID YOU NOT SEE WHERE I SAID NO PERSONAL ATTACKS? WE DO NOT NEED TO BE CALLING ANYONE AN IDIOT. I’m not saying that the zoning points are invalid. But that’s not Elorza’s argument. Which smells funny to me. He says the city asked for a time table and the developer agreed. The city asked for public benefit money and the developer agreed to that too. But he had to veto to this for design reasons? Without stating what, in the current design, he finds problematic? Sounds very much like a cop out. Is this project deeply unpopular with what Elorza perceives as his voting base? Honestly Joel, that doesn’t go far enough. If we want other Lambo owners to know Providence is the place for them, we need to not just avoid giving them parking tickets. If we want to put ourselves on the map, we need to abolish speed limits, make stop lights “optional,” and honestly if we’re really serious about being a Big City that attracts Lambos, we need to probably subsidize some Lambo-only highways to really encourage them to come here and pay their car taxes and hire a couple of mechanics a few times a decade. In fact, there seems to be a big gap of land conveniently located right in the middle of the city that to me at least looks perfect for a Lamborghini Only Sky Superhighway, that really shouldn’t be wasted on whatever short 10-story buildings regular people might build there. There’s also some space around town–East Side, West Side, South Side, North Side in particular–that aren’t really being used to their maximum Lamborghini-attracting potential, and if we could put some L.O.S.S.es through those neighborhoods, maybe Providence could finally be taken seriously. Welp, Elorza just sacrificed any and all gubernatorial ambition. He is now going to be labeled an anti-growth Democrat candidate and would likely not even win the primary. This is the biggest economic blunder I have seen a City mayor commit since Cianci was mayor. Who is advising him? I have lost all faith in Elorza. We can only hope that the State revokes any and all power he has to stop this development. I believe that this will be built without his support, somehow. It will be a great success and Elorza will never be able to take credit now. He has painted himself into a corner. This is just a terrible decision, terrible strategy… I am just shocked he’s being advised so poorly. I am very grateful that the Mayor has vetoed the zoning change for the Hope Point Tower. Mr. Fane is only interested in Providence, and only interested in this site, because he would have access to massive public subsidies. Providence will grant a 20-year TSA to projects valued at over $50 million on the 195 land. Furthermore, the RI Commerce Corp has been extremely generous in granting subsidies for 195 land development. The adjacent Wexford development, valued at $105 million, is receiving $18.8 million from the 195 Commision (overseen by the Commerce Corp) and $13.5 million from Rebuild RI tax credits, also overseen by Commerce Corp.
Fane’s request is extortion, plain and simple. The extortion is by the Mayor…design must be determined by the city? It is a state parcel. To respond to Sam, it surely is to appeal to his East Side base…the base 5hat pushed him over the top.. He has forsaken the other 180,000 who do NOT oppose this change, hoping they will forget or just shrug it off. I don’t agree with the Mayor’s decision, but it’s not uncommon in many jurisdictions to have final approval over a design. Such approvals are usually given in the context an established design review board or a historic district commission with a specific time frame for how long the process will take, generally not open ended. Usually this is limited to exterior form and finishes. A city has nothing to do with how a project is marketed. There’s been much discussion about how expensive per square foot the selling/rental prices would be for the Providence market. Was Providence or Rhode Island the intended market? Was it Boston instead? With the Mayor’s veto and the apparent disinterest by the city council to revisit this issue, it will now be up to the state. The folly in the Mayor’s veto is that it’s possible the state could override not only the city’s zoning, but any design review process. If the state is successful, it might not just be this parcel, but all parcels within the 195-land that could be up zoned with disregard for building heights, activated streetscapes, or building base parking structures, etc. The potential outcome of this is not dissimilar to a tower proposal in Federal Hill roughly 10 years ago, where the developer had all the financing in place, the zoning for the site was proposed and advocated for by planning and development, they were prepared to start construction, but because of neighborhood uproar (about the scary tall building) the project was killed. The irony with that one, the proposed building was at the base of West Exchange downhill, so it wouldn’t have been visible from most of Federal Hill. Even with the 2014 improvements to the city’s zoning is still pretty bad. Maybe a state override would be a good thing—a wake call to Providence to fix it. Opportunity is here, take it Providence! Or else someone else will! Yup…Email the 15 City Council members!!! Tell them that the Mayor DOES NOT represent the 180,000 folks who do nit oppose the zon8ng chance. What’s the easiest way to contact members of the council? Go to the City of Providence site. On the left is City Hall, then City Council, then Members. They all have government email addresses. The key one is HARRIS. There is no market in Providence for rents at 2.5X the current highest local rents. As suggested by a friend, the math is *so* off that even with immense public subsidy as described by Brendan, the only explanation that makes any sense is that Fane is essentially looking to jack up the value of the parcel, sit on it for a few years, and sell (the lot and the approvals) at a major profit–with no Tower ever being built, and RI having been played for fools. Then whoever buys it can build something that also doesn’t meet the democratic-process-derived zoning. Whether the above is correct, or if by some miracle the building were actually built—either way, it will be an embarrassment for RI and Providence, and evidence that far from being a “Big City,” it will instead broadcast that we’re easily highly insecure in who we are, easily bamboozled and ripe for the fleecing from other out-of-state snake oil salesmen. Elorza is on the right side of history, speaking up for Providence as a place that can do better than that. First, your statement “…and every neighborhood association in town, and many hundreds of citizens who weren’t paid by construction companies to attend Fane Tower-related approvals meetings)” is not accurate. Only three neighborhood associations oppose it, many residents – including me – spoke in favor of the change on our own, and 180,000 others DO NOT oppose it. Second, Fane is not bestowing anything upon “Rhode Island”. It is a major investment in Providence. Third, the math, in the article fails to 1) project the anticipated movement of higher income folks to PVD instead of Boston, 2) the development of higher income jobs in the district, and 3) the potential move of national corporations to PVD as part of the Governor’s strategy. Fane sees this and wants to get ahead of the wave. That is why he agreed to a build certain timeline! Fourth, “do better than that”? What, another puny 6-10 story apartment/hotel fitting into a pitiful master plan more fitting for a PVD suburb than downtown PVD? The Elorza approach is small city thinking, the BANANAS are a small group with a small town mentality, and that is why we are in this boat. Providence is in fact on the edge of big city status – but that requires a big city attitude. That is what is lacking in this city government. Vision without action is a dream, action without vision is a disaster. And the story is the same across the country, San Francisco, Seattle, Toronto, Miami, New York… all are seeing residential building booms coupled with an affordable housing crisis. And affordable not meaning section 8 vouchers, affordable meaning middle-class people not able to find affordable housing. How many tens of millions of dollars in subsidies should the city and state give out to create a colossus for wealthy people to park their money? Yes, we should continue to focus on the 4 to 10 story buildings and infill in the neighborhoods that can be built at a cost to be rented and sold affordably to people who live here now, and to continue to attract people to our distinct cityscape and affordability. I know it hurts people to hear this, but we are a small city, and that’s exactly what is attracting people to live here. The people who want to live in big cities like Boston, New York, or Seattle (and can afford to do so) are moving to those places. People who want to live in a smaller more affordable city are moving to places like Providence. It is laughable to try to compete with Boston, we’ll never be Boston, and most of us don’t want to be (we’d just live in Boston if that’s what we wanted). In effect, we are a suburb of Boston, and there’s nothing wrong with that. Every large city has a collection of satellite cities that serve as a pressure valve for affordability in both the residential and office markets (Providence, Worcester, Manchester, and to a lesser extent from Boston – Hartford, Springfield, and New Haven). We’ll attract some smaller companies that want to be close to the action in Boston (and we have been doing that), but the GEs and Amazons of the world are never parking their headquarters here, and that is fine. If we have tens of millions of dollars to throw around, we should be focusing on our relationship to Boston. Improving commuter connections (electrifying the commuter rail to reduce commute times). That makes it easier for the large companies in Boston to establish satellite operations in Providence, for smaller firms that can’t quite afford Boston to see us as an option (rather then the suburban suburbs of Boston), and for people who want to tap into the Boston labor market, but cannot afford and/or do not want to live in Boston to see us as a viable alternative. From a public point of view and from what I’ve been hearing over the past few months is that the vast majority of Rhode Islanders want this project to happen. That includes Providence and non-Providence residents. Ian, you need to check the facts. You’ve stated multiple incorrect, or patently false things. Nobody who develops on the 195 land is being allowed to “land bank”. Only surface parking lot owners are allowed to do that (joking, but not really). Also false is the statement that this tower will have only units that are 2.5x market rents. This is not accurate with respect to this design, previous Fane projects, or anything that has been published by the developer. In fact, his Chaz Yorkville tower in Toronto, which is nearly identical in scale, had units starting in the mid $200K CAD… which would be $1,100-1,300/mo. mortgage payments. Far from the 2.5x multiple that you claim. Third, yes… Elorza will be on the wrong side of history. His political aspirations are finished. You can’t “save the city”, at least the finances, without expanding the tax base. He won’t be remembered for anything that helped wright the ship. He will be laughed at regionally by other mayors for not securing $300,000,000 in private development dollars. We aren’t laughing here because this is just terrible for us that pay taxes in Providence. Downtowns are supposed to have tall buildings, and tax stabilization agreements are not cash dispursements to developers. This backwards way of thinking where someone disagrees with a project because they don’t want to “give taxpayer money to…”. Wake up! Would you rather have $20,000,000 a year in years 12-perpetuity, or $0 for perpetuity? If I have to hear one more person talk about “market studies” or that the market can’t absorb these units. Nobody would spend $300MM without knowing there is a market for their product. The developer knows more than a small, local appraiser — and sorry, he knows more than you. He has paid for his own studies. This is akin to a Red Sox fan saying… “I really like that pitcher, he’d be a great addition to the team, but man… $10 million is too much money, I don’t like him at that price” — IT IS NOT YOUR MONEY! Of course adding 1,000 high income residents, paying taxes and spending money locally will help. You’d be foolish to think otherwise. Providence as a suburb of Boston is an urban myth. More like a pipe dream that many have come to believe as true. If that were the case, we would see development spreading away from Boston and moving in our direction, with early indications of that manifested in RI communities north of Providence with rail access. Again, that has not happened because non-Rhode Island capital simply has no confidence in the RI market and its local players and stakeholders. The global investment community doesn’t trust that they will receive a fair shot. What is happening to Fane is all the proof they need that things have not and will not change in Rhode Island, specifically in Providence. Rhode Island is quickly running out of time to reverse course. With Richie Neal and Jim McGovern slated to become chairmen of key House committees in charge of budgeting capital infrastructure, Massachusetts will enjoy rail access from Springfield to Boston via Worcester. When that happens, and it will happen during the next five years, it will be game over for Rhode Island and Providence will be relegated to becoming a backwards, one-horse ghost town. While I do not agree with the Mayor’s veto I do believe that he was left with no other form of recourse to get what the city coffers need from a project of this scale. Which in this case I am led to believe is the Innovation District’s public park / pedestrian bridge construction or maintenance funding. Which for the cities residents would be a big win from a project of this scale. Normally these type of projects ones with condos have a well funded trust to pay for maintenance, repairs, and improvements to the building. For a city like ours whose parks have neglected for so long that they have a backlog of repairs.. Which we now need the funding of sponsors to pay for.. I support the mayors veto if only for the reason of using it as a tool to gather the funding a city of this size needs for its public recreational areas. First, I agree that we “…should continue to focus on the 4 to 10 story buildings and infill in the neighborhoods that can be built at a cost to be rented and sold affordably”. NOT downtown. Second, PVD is NOT a small city, far from it. Check the population listings. It is the core of the 39th largest metro (out of over 330 metros). Third, PVD is in no way a suburb of Boston. Not in any way,shape, or form. It is a capital, a major port, a cultural, historic, governmental, educational, manufacturing, and transportation center on its own. Manchester, maybe…as it would be if it were in the New Bedford area. The others you mention are smaller and at most less than half the population of the PVD Metro. And Hartford and New Haven are NYC urban extensions. Let’s not inflate Boston. They do that enough on their own! Forth, we do not need to tie transportation to BOS, we need to build it in the PVD metro…from Westerly to New Bedford. Lastly, no compres PVD to BOS…that would be an insult. What we should do is build a climate that can compete with them. That doesn’t mean winning most battles…we will not. But it means getting bigger and stronger. I know many that live in Boston and pay through their teeth to live there, the bubble is going to pop and the next place to live for those who work in Boston, is Providence. 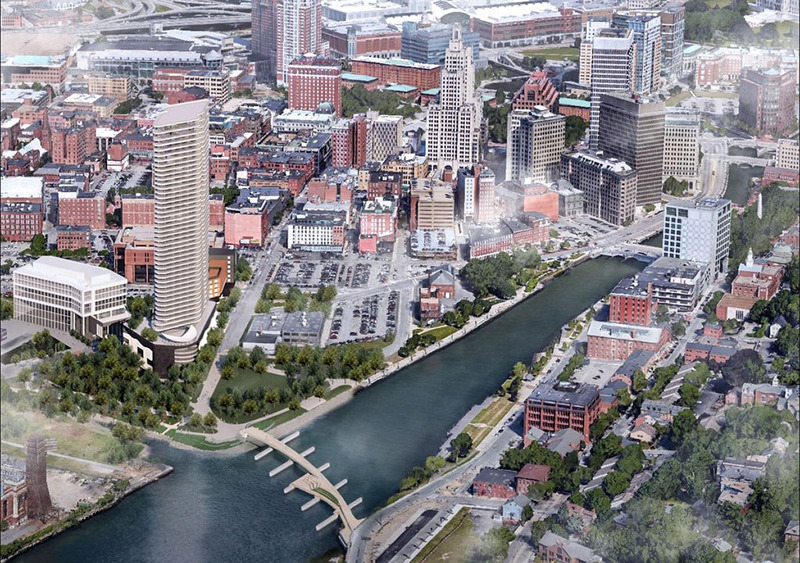 Creating incentive to live in Providence is vital, and this project does just that. Slightly off topic, for Bostonians to seriously consider moving to Providence in any numbers, the MBTA trains must be fixed. – Turn (or reverse) trains much faster at SS. The ideal situation would be to build the North South Rail Link (NSRL) tunnel. Even without NSRL, travel times from PVD to SS could be improved from well over 1-hour today to less than 50-minutes. Hi Peter: Can’t say I disagree with your rail improvement comments and how those could benefit Rhode Island. However, the Mass congressional delegation will greatly determine where these take place and right now their focus is on a rail connection between Springfield and Boston via Worcester. When Bostonians understand that they can buy a nice, roomy house on a decent-sized lot (1.5 acre-plus) for less than $285K out in western MA and get to their office in Downtown Crossing and back for dinner with the family, any chance of attracting those folks to Providence will be long gone. That’s not what the Massachusetts advocates and a fair number of Boston area politicians are saying. They know that changes to the current commuter rail system where 65% of Mass residents live and jobs are located in, is the area where it’s essential to make improvements first, especially as traffic has become unbearable. Because the PVD line is already mostly electrified and that the PVD line has the highest ridership, plus PVD Station is the busiest outside of North and South Stations and Back Bay it was determined first by people in Massachusetts that the Providence/Stoughton lines plus the Fairmount lines should be the first to be improved. Worcester most likely would follow. Springfield will happen, but would be in the 1 1/2 to 2 hour one-way commute range, even if electrified. A $285k house in the Providence, New Bedford or Worcester areas would be more appealing than one Springfield with its commute. And just to beat the dead horse, last session, the Massachusetts Senate President who was from Worcester, put forth legislation to modernize MBTA’s commuter rail starting with the Providence Line. It didn’t pass because of budget problems, but the interest was there. Refer to TransitMatters, Transportation4Mass. The NSRL Working-group has dozens of politicians from eastern Mass supporting the NSRL and commuter rail improvements in Metro Boston. Also Commonwealth Magazine has written extensively on this. Peter: Rail priorities as envisioned by the incoming Congressional committe chairmen (Neal and McGovern) are redefining the discussion. Charlie Baker is now agreeing with their point of view of achieving the east-west rail connection in return for fresh dollars for deferred maintenance of old MBTA infrastructure in greater Boston. Stay tuned to the committee hearings starting on December 18th. Heres a question. While the master planning was underway to create the zoning on the 195 land, did it occur to the city that there could be a situation such as this that an investment/ project of this magnitude would even be possible? And did they always assume it would be rejected no matter its benefits? I could be way off base with this, my impression from the beginning is that the city was trying not to make waves with the public. It’s not clear that the planners ever understood value or real estate development or job creation. The “big” buildings in the district were supposed to go right next to route 95 (the tallest of which would be just half the size of the Superman or One Financial Plaza). I suppose people who are driving in cars on 95 would know your building, but is a site exposed to loud noise and heavy pollution the most valuable? The obvious place were there’s the highest value is in most cities is waterfront, followed by parks. Often in Providence you hear references to Bryant Park in Manhattan. It’s not clear that people understand why Bryant Park works. Bryant Park is some ways is similar to Kennedy Plaza/Burnside Park, but also not. One difference has to do with activation with people. Except for the library, Bryant Park is in effect surrounded on four sides by very tall building that hold a lot of people. KP has a couple of tallish buildings (one empty) and a hand full of low to mid-rise ones, plus no subway. Which would be better for a park a low to mid-rise building(s) with fewer people or a tall building(s) with a lot of people? Why are the tall buildings of the financial district next to the river ok, but Hope Tower in the 195-land not? Except for an occasional runner or dog walker, the current waterfront park is empty most of the time. It’s always baffled me why do planners often think they have the magic recipe for urban places? How did all those modernist plans from the 60s work out and post-modern New Urbanist plans for the 90s? Peter, you make valid points sir. You should be in front of that council with this type of explanation because it makes perfect sense. I’ve been using Bryant Park, Central Park, Boston Commons as examples for months to compare to this project. Urge her to vote to override that outrageous veto!! What time does the City Council meet tomorrow? Make sure to e-mail Councilwoman Harris to let her know why you think the tower is a no-brainer for the City. Losing this opportunity would be devastating. Two Council members not present. Proceeding postponed. In reading these comments I can’t help but wonder how many come from Providence residents and how many come from people in the building trades who simply want the work and neither live in Providence(or even RI) nor have any understanding of the local real estate market. This project is not viable without massive public subsidies. Tim – I live, own a home, and pay taxes in PROVIDENCE. Like the other 180,000 who do not oppose this. There are no further subsidies on the table. The developer determines viability…to the tune of a $300M investment. Peter – Who? Until when?? I heard on the news that it now will be held on Thursday. BTW I’m not in the building trades and live both in Newport where I own a house and New York where I rent, and grew up mostly in Lincoln, but also in Providence. My family and I are from Providence, now live just outside the city but work in the Jewelry District in the Design/planning field. My colleagues (some currently living in Prov) and I discuss this project weekly as we can nearly see the lot from our office, we all agree this tower is great for the City. Tim, nobody is building in Providence without tax stabilization agreements. This project is viable with what everybody else is getting, and it will sell 50% of its units before they get their C.O. Nobody knows more about the project than the developer, and he is putting $300 million on the line. I live in Providence (West End) and every single person that I have spoken with that lives here (let’s say over 40 people), all but 2 were 100% “build it”, and the remaining 2 wanted to see Fane commit to maintaining the park, which he committed to verbally to Elorza. Providence residents want this tower. It is the elite East Siders, led by the PPS, that are fighting against this project. Small-minded individuals that have an ounce of local power are afraid to lose that power because someone from out of state is coming in and spending $300,000,000. This investment dwarfs anything that these local small frys own or have developed. They like having City Hall on speed dial, and that could change if out of staters with real money start looking to Providence for their next projects. Don’t be fooled, this is a power struggle — it has nothing to do with the design. I feel as if the naysayer’s aren’t completely sure why they oppose it, while the ones that are for the project have thorough explanations about why this project is good for the city. I watched the Executive Director of the Providence Preservation Society interview on the Dan Yorke show. As he explained why he was against the project, his reasoning almost began to transition to why the tower is good for the city. In other words, he couldn’t exactly give a strong reason why the tower was bad for the city other than some minor issues such as the placement of the buildings service area. I’m a huge fan of the work done by the PPS and don’t disagree with at last a portion of what he said, but it wasn’t nearly enough to convince Dan nor myself why this project shouldn’t happen. These reactions are emotional responses—not wanting things to change or maybe a sentimentalized or nostalgic idea of what the city is or should be. Tim: Live in Providence. In the city planning field for more than 20 years (practice and teaching the stuff). The tower is a must. The longer we wait, the harder it will be for us to catch up with what other capital cities are doing nationwide. Not comparing Providence to global capital municipalities because we just can’t compete at that level. Saying no to this project will be fatal to Providence and Rhode Island’s regional standing and local economy. Time to let the adults handle this. Jorge can continue having fun with the crazy carts at the ice rink. Thank you council women Harris! Thank you Councilwoman Harris! Providence is moving forward! Indeed! !’ Thank you to all who voted for the override.